Teaching process has developed in the recent times and in future there is a huge possibility of having a good kind of methodology that can elevate the learning process to a different extent. The possibility of learning in a different manner has grown due to the involvement of different kind of teaching methods and creative thinking of the school administration. These kind of creative thinking is the main motivator of birth of blended learning. The process is totally different from the current context of teaching. A modernized approach and sense of responsibility is the main key of success. In the current context it is seen that the methodology is widely accepted and it is becoming the best kind of option for the modern classrooms to make their students more capable of doing things in a better way. There are many models involved in the process and the benefits are astounding. 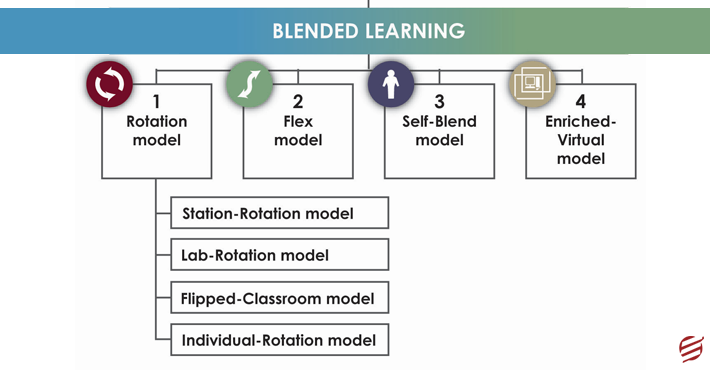 The basic definition of blended learning can be interpreted easily if the learning method is segmented in different parts. In a blended learning process the student and teach both undergoes different aspects and sessions. In this process the practical experience and theoretical representation both accumulates in a single medium and produce far better result than normal teaching process because in this process the involvement of the student can be seen easily. There are some models that are used in the process and they are described below for convenience of the new learner of blended learning methodology. It can be easily understood because the name says all. In this method the students are divided in different groups and on a regular basis they are given tasks to perform. Apart from that the stages that are included in the section must have the ability to make a creative environment where the student can learn and apply the learning for a better clarification. 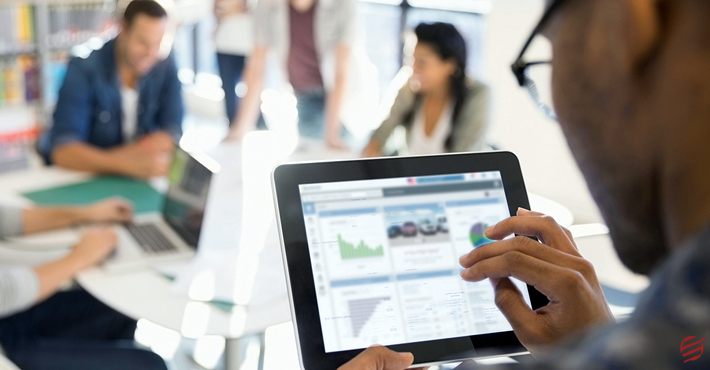 The steps must include at least one online learning segment. Apart from this the students’ are given group assignments and paper pencil work where they can perform and show what they have learned in the process. It has some sub-stations and they are described below. Station Rotation– the stations that are present in the classroom must be visited by all of them in order to understand what are there and what are the importance of them in the learning process. There is not a fixed schedule where the students don’t have to go for something that is not for him. In this kind of learning process the student must go to all the given stations and execute the task that is given to him. If you are a learner then extracting all must be the main aspect of yours. Lab Rotation– It is a process in which the students have to go to a computer lab and learn from the online content in a regular basis. Flipped Classroom– It is a process in which the students are included in a particular task after getting online content. After getting the knowledge from the online content the students are asked to take assistance of the teachers in order to have better kind of extract from the knowledge. The main task is nothing but getting into the learning process and expressing all the knowledge that is derived from the online content. Individualized Rotation– In this section the students are asked to go for some particular aspects that are decided by the teacher. The playlist oriented knowledge gathering is the main objective of this kind of learning. It is a process in which the main backbone of learning is online content. The teacher acts as an observer and the student is given different kind of tasks apart from any kind of homework assignments. In this case the students are getting online support and the teacher or other helpers provide a face to face support to them who need a better interpretation of the given knowledge. The face to face support is not that much extensive all the time but it is helpful in evolving the certain aspects that are necessary for full enrichment of the person. It is an online learning medium where the students learn something on an online basis and in the endo of the day the online support becomes the most important part f learning. The teacher provide service on an online basis and the service taking student gets a good kind of extract from it and use it in the daily life. This kind of learning process needs face to face involvement of the teacher first in order to understand the main aspect of study. Apart from this, after learning the process the student can execute the given task from any remote location. In order to give better guidance the teacher can help him on the online medium. All of this kind of things are new to several teachers and there are some online service providing organizations that are giving the best they can. The online help is being provided by Essaycorp too and they are familiar with the process. The online support of the company is really good and it is reaching new heights in a daily basis. Learning becomes easy with the help of the experts and they are serving for a long time. 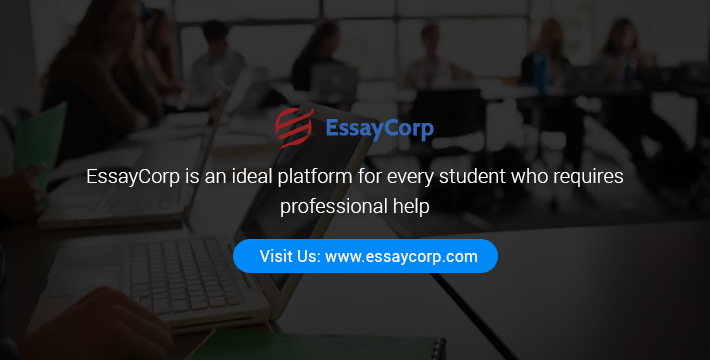 This experience makes the Essaycorp a worthy shot for any service seeking student like you.